EzyNest Wood is the flagship of our nested-based products, combining the feature set of EzyNest Plus with the ATP module. The ATP module is the solution that dynamically links your cabinet design software by applying tool paths, nesting and outputting to your router. With just three clicks you can send complex cabinet projects to your router in seconds. 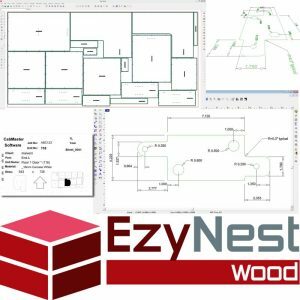 EzyNest Wood is your best NBM value. It imports generic layered DXF files which are generated by the CabMaster, DoorMaster, TopMaster and RobeMaster products.